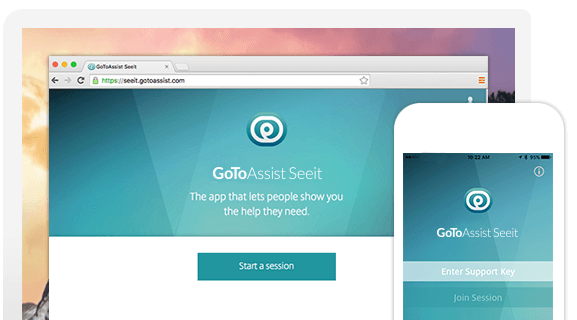 Invite customers to join your support session using the GoToAssist Seeit app. When a customer is looking for help, they don’t want to be kept waiting. Using the GoToAssist Seeit mobile app, customers can enter a support key to jump into a session instantly, ready for live camera sharing. Beats driving across town any day. Give your customers a convenient way to join you by emailing them a session link. The link will take them straight into the app and connect to your live session, skipping the task of entering the support key. 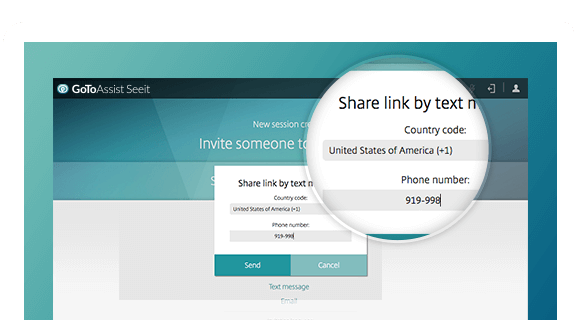 Or if it’s easier, you can even text customers the link from within GoToAssist Seeit. Free to install. Simple to use. Available on the Apple App Store and Google Play, the GoToAssist Seeit app costs nothing for your customers to download. One quick download later, and your customers are ready for prime time. The app itself is designed for ease of use, so customers can get the help they need without hassle. Shine a light on the problem. The customer’s connected and the camera’s rolling. Now you just need to see the issue clearly. The mobile app has flashlight functionality, so ask your customer to turn it on when you need the extra light. It will help illuminate those hard-to-see areas so you can take a better look. Log in from anywhere and launch a live video session within your browser.